Caffeine overloading, rooftop drinking and market feasting… New Zealand’s capital city is a total foodie’s paradise. And, if you needed another reason to visit Wellington, Jardin Grill is that exact reason. Located within the recently reopened Sofitel hotel, the restaurant is the perfect spot for a stunning meal, cocktails with friends and everything in between. The hotel’s luxurious French flair continues through the on-site restaurant as the team welcome you with a friendly “bonjour!” Showcasing a modern botanical theme, the restaurant oozes intimate and elegant vibes. 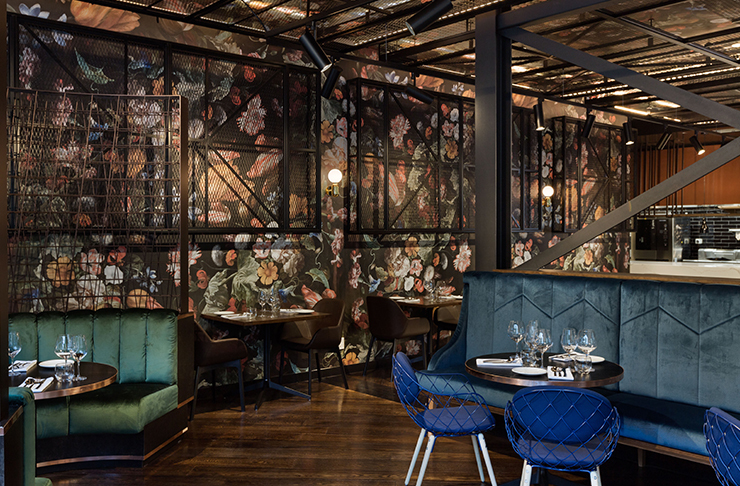 You’ll be enchanted by the velvet and leather seating, dark wooden floor and show-stopping floral wall. The dim lighting creates cosy vibes with a hint of romance—table for two, anyone? Outside, you’ll find a roaring fire pit, creating the perfect spot to toast the evening away. Alternatively, work your way through the botanically inspired cocktails in The Green Room bar. The gin-based St Germain des Prés is the perfect balance of refreshing cucumber and fiery chili—it’s unmissable! Back at Jardin Grill (French for garden FYI), you’ll find a menu celebrating fresh and seasonal produce with a French twist. Ease into an evening of deliciousness with charcuterie, cheeses and freshly shucked oysters—sourced from Waiheke Island, nonetheless. The best start to a meal, right?! Moving on to entrees and you’re spoilt for choice with steak tartare, chargrilled vegies and lamb ribs. If you’re seafood-obsessed like us, the delicate scallops have your name written all over them. 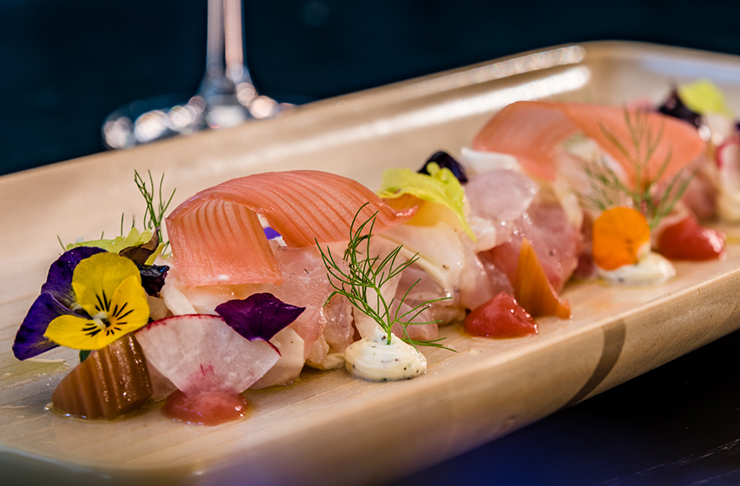 The market fish crudo is also a favourite, featuring rhubarb, dill and fennel—yes, please! The magic continues across the main affair where your taste buds are treated to asparagus risotto, beef bolognese and venison loin. The rotisserie pork belly stars charred onions, crushed olives, sweet prunes and a whooole lot of delightfully crispy crackling. However, no visit to Jardin Grill (keyword: grill) would be complete without ordering from the wood-fired grill. Fired by Manuka wood, the cuts of beef are cooked to your liking and served with sauces and sides. The charred asparagus with burnt butter is a crowd-favourite for good reasons. There’s always room for dessert and you’d be crazy to say no to Jardin’s decadent treats. The aptly named spring garden dessert takes inspo from the nearby Botanic Gardens and its seasonal blooms. The current offering is all about rose, pistachio and lychee and trust us when we say: it’s almost too pretty to eat! Accompany your meal with a vino from the extensive wine list that focuses on local and French delights—or check out that cocktail menu again! Once you’re wonderfully satisfied, sleep off your food coma in the luxurious five-star accommodation above—how convenient! And, come breakfast time, you’ll be pleased to know Jardin Grill also brings its A game for both brekkie and lunch. So, what are you waiting for? Get booking those tickets to Welly! There’s a new opening calling your name. Editor’s note: This article is proudly sponsored by Sofitel Wellington and endorsed by The Urban List. Thank you for supporting the sponsors who make The Urban List possible. Click here for more information on our editorial policy.